We reviewed the translation service DeepL in 2017 when it came out and found it to produce -- on average -- better translations than established services such as Google Translate (Mozilla is working on implementing it in Firefox) or Bing Translate. DeepL notes in the press releases that support for these two languages "provides half a billion more people" with translation support. The company promises that translation quality for these two new languages is as good as the translation quality of languages added previously. 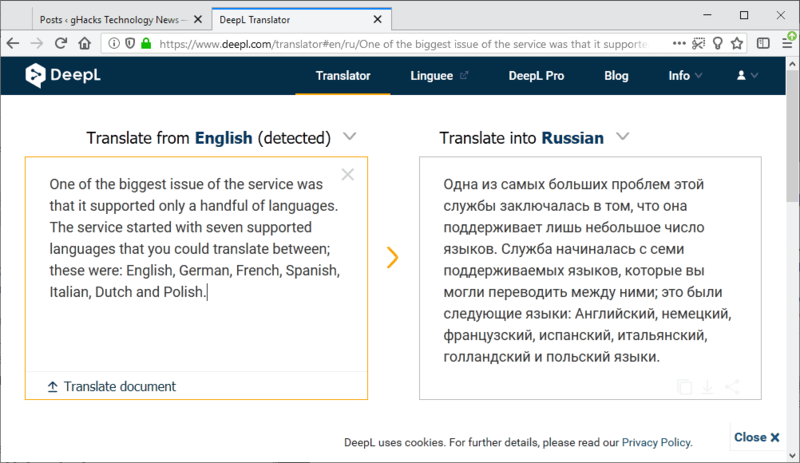 In blind testing that compared our translations to those of other systems, DeepL’s Russian and Portuguese services consistently emerged as translators’ favorites. Internet users can point their browsers to the DeepL homepage to use the translation service free of charge. Russian and Portuguese can be selected as source or destination languages, and translations to or from these languages are instantly provided. DeepL promises that it plans to add more languages in the future but did not list any in the press release. The addition of two new languages is a good step in the right direction and will certainly push DeepL forward even more. Nine languages is not the world, so to speak, though; there are still dozens of languages that tens of millions of people, or even more, speak. It makes sense to pick widely used languages first and only release them once the quality level is high enough to justify a release. I'd like to see Chinese and Japanese support next, what about you? Now You: Which translation service do you use? The translation service DeepL announced support for two new languages, Russian and Portuguese, today that increases language support to nine. Finally, I’m from Brazil and I was looking for some alternatives besides Google Translate for translating my language into languages other than English that I already have mastered. I also use it to further improve my vocabulary and to converse with my friends from other countries. Hope to see support soon in DeepL. English education is a compulsory subject from 10 years old to 15 years old. However, since Japan is in a geopolitical environment that lies in the location of an isolated island far from the Eurasian Continent, opportunities to contact other languages are poor and it is difficult to raise skills in everyday life. Because of that, most Japanese can not read and write even the languages of the other side of the shore (Chinese, Korean) and can not hear it. In the Internet era to realize a real-time global, the mainstream of the language is “English”. For the Japanese who can not communicate in English, practical translation function is essential function. Google translate integration with Chrome is very good. You right click on a page and it is translated. It even works in realtime, I’ve used it in chats. Firefox could definitely use native support for translation like this. any extension of Deepl.com in firefox or chrome?. Thank you. There are extensions but they don’t support direct page translations, yet. Click to open the interface in the browser, type or paste text you want translated to have DeepL return a translated copy of the text. Well, one shouldn’t rely only on one single service. Генерал-майор Лемюэль Шеперд (Lemuel Cornick Shepherd, Jr.), командующий 6-й дивизии морской пехоты США на берегу Окинавы. Google: Major General Lemuel Cornick Shepherd, Jr., Commander of the 6th US Marine Division on the shores of Okinawa. DeepL: Major General Lemuel Cornick Shepherd, Jr.
As you can see, DeepL omits some part of the sentence. If I keep putting point marks at the end of the sentence, DeepL gets it complete as Google. I WAS REVIEWING YOUR COTIZACION DE VENTA LIST (ATTACHED) OF MATERIALS NEEDED TO REPAIR AND PAINT THE HOUSE. I NOTICED THAT THE BENJAMIN MOORE HOUSE PAINT WAS NOT LISTED. WILL THIS BE AN ADDITIONAL EXPENSE AND IF SO, HOW MUCH WILL IT COST? Estaba revisando tu lista de colaboración (adjunta) de los materiales necesarios para reparar y pintar la casa. Noté que la pintura de la casa de BENJAMIN MOORE no estaba en la lista. ¿SERÁ ESTO UN GASTO ADICIONAL Y, EN CASO, CUÁNTO COSTARÁ? ESTABA REVISANDO SU LISTA DE COTIZACION DE VENTA (ADJUNTA) DE MATERIALES NECESARIOS PARA REPARAR Y PINTAR LA CASA. NOTÉ QUE LA PINTURA DE LA CASA DE BENJAMIN MOORE NO ESTABA EN LA LISTA. ¿SERÁ UN GASTO ADICIONAL Y, EN CASO AFIRMATIVO, CUÁNTO COSTARÁ? The input was in capital letters as I suffer from AMD and most of the time I type in Caps. The DEEPL translation appears to be much better and it didn’t convert my words to lower letters.